Make a ball with the dough. Chill dough in freezer for 30 minutes. Put dough between 2 pieces of parchment, and roll dough out to 1/4 inch thick. Use a cookie cutter to cut out 2 hearts of the same size. 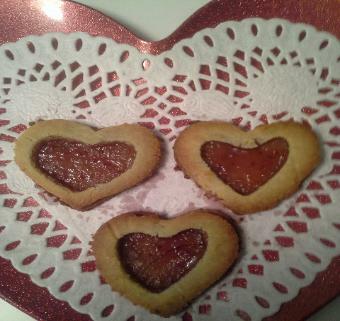 Take a smaller heart cookie cutter and cut out the center of one of the hearts. Press your thumb into the solid heart to make an indentation. Fill this spot with the preserves. Place the hollow heart on top of the heart that has the preserves . Bake hearts at 350 degrees on baking sheet lined with parchment paper or with silicone mat. Bake for 6 minutes or until golden brown.